Director John Woo’s Red Cliff is billed as the most expensive movie made in China to date. Woo made his cinematic bones creating the balletic violence that defined much of Hong Kong cinema in its heyday and later plied his trade in Hollywood, turning out movies such as Broken Arrow, Face/Off and Mission: Impossible II. 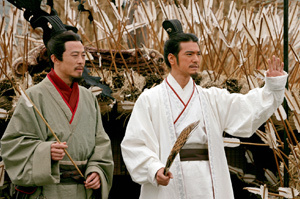 With Red Cliff, Woo serves up a historical epic that artfully mixes action, history and fantasy. Weighing in at a reported cost of $80 million, Red Cliff has been condensed for U.S. consumption from the two-part, 4 1/2-hour Chinese version, a major disappointment for purists. But that shouldn’t deter U.S. viewers from taking a look. Though a little confusing at the outset, the story ultimately becomes clear, and the battle sequences — presented with a CGI boost — are astonishing, huge in scale and careful to delineate the tactics being used by rival armies. At 2 1/2 hours, Woo’s Red Cliff stands as a captivating action movie that emphasizes the story’s broadest themes, notably the battle to protect the beauty of southern China from encroachments by the tyrannical North. The version playing in U.S. theaters makes sweeping battles the dramatic focal point of Woo’s extravaganza, but unlike lots of American movies, the battles aren’t just blood-and-guts spectacles. They’re carefully orchestrated, the result of calculation and planning by the generals who are conducting them. Woo concentrates the story’s villainy in a single character, prime minister Cao Cao (Zhang Fengyi). Early on, Cao Cao bullies Han dynasty emperor (Wang Ning) into fighting a war against two rebellious factions in the South, one led by Liu Bei (You Yong), the other by Sun Quan (Chang Chen). We later learn that Cao Cao’s motives may have something to do with winning a lost love, a graceful beauty (Lin Chi-ling) now married to a southern general (Tony Leung). Red Cliff tires to show how great warriors balance force and cunning. Zhuge Liang (Takeshi Kaneshiro) is a kind of warrior/diplomat who tries to unite the forces of the South. The movie also introduces us to a female warrior, San Quan’s sister (Zhao Wei). Leung plays a general with a keenly developed sense of aesthetics. His beautiful wife sees the tragic folly of war. Alternating quiet scenes with spectacle, Woo achieves a significant "wow" factor that includes an amusingly novel way for the forces of the South to acquire more arrows once its own supply is dangerously depleted. He stirs the imagination with the movement of vast armies, with assaults on fortresses and with a massive armada of war ships that seems to fill the entire Yangtze. Woo understands that epics demand scale; toward that end, he has spared no expense. Even in this condensed form, Red Cliff delivers plenty of action-packed goods, but it also has some soul, expressed in the behavior of generals who play musical instruments and who are keenly aware of the importance of turning nature into an ally. When Cao Cao admits that a cup of tea has influenced the outcome of the final battle, we know we’re in the hands of a director for whom civilized pleasures are at least as important as brute force. On behalf of Magnolia Pictures and the movie’s producers, many thanks for plugging "Red Cliff" ... .. thanks also, on behalf of the distributors and producers, for not posting any pirate copies or non-trailer clips of “Red Cliff” and if you / your readers want good quality, non-pirated, previews, then the official trailer for “Red Cliff” is available for fans and bloggers to post/ host / share etc at http://www.apple.com/trailers/magnolia/redcliff/ ... .. for further details of on-line promotions for this movie and Magnolia releases generally, check-out www.magpictures.com and their official YouTube channel at www.youtube.com/user/MagnoliaPictures .